Have you ever roamed the supplement aisles and wondered if you could create your own herbal apothecary? Well, you can! There are many ways to create effective products right from your home garden. Even if you don’t have a green space of your own, these days quality herbs are easily available for purchase. One of the first things most budding herbalists learn how to make is tinctures. Tinctures are alcoholic extracts of plants, they have a long history of use, and can easily be taken on the go. 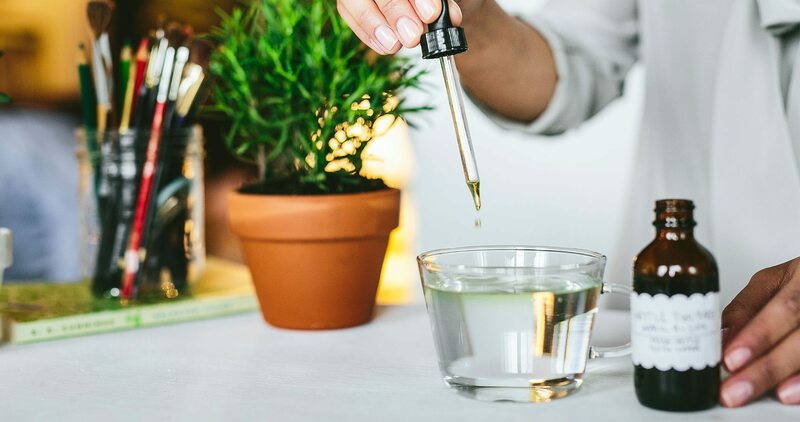 While there are many different ways to create tinctures, we’d like to start off by teaching you all the “folk method.” This method is a simple way to make tinctures without having to fuss over weighing the herbs or doing lots of math. We prefer using brandy or vodka when first starting out because their ratios of alcohol to water are appropriate for many herbs, such as the nettles we have chosen to use in this article. If you are feeling creative, you can use this format with herbs from our tea bags! If this is something you’re interested in doing, we’d suggest making tinctures from our Herbal Teas line. Nettles are a great spring green to tincture. It’s a superior herbal tonic that supports joint health* and grows abundantly in many places across the United States. While it is covered with microscopic hairs that sting you when touched, we still adore this plant. Nettle’s fierce exterior is just a front, and underneath is a gentle and nourishing herb that can be used in tinctures, eaten as a food or made into a rope from its strong fibers. We recently dedicated an entire article to nettle called Nettle 101, which gives you even more information on this incredible herbal ally. The first step to creating this tincture is to gather your herbs. You have a few options: you can harvest nettles carefully with gloves, purchase them dried locally, use herbs from our tea bags or order in bulk from Mountain Rose Herbs. Nettles are often found growing abundantly in the wild, but if you do decide to do some wild harvesting, we would suggest that you get a Peterson’s Field Guide or find an herbalist to help you identify the plant, and reference The United Plant Savers “Species at Risk” list before harvesting. If you are working with fresh nettles, we recommend using gloves and wearing clothing to cover your skin to avoid a sting that may itch and tingle for a few hours. Chop the nettles as small as possible, because the more herb chopped, the more surface area covered during the maceration (or extraction) process. Then fill your Mason jar about ¾ full of freshly chopped herb, and cover all the way to the top with alcohol. When using dried nettles, we’d suggest filling your jar ½ way and then cover all the way to the top with alcohol (also known as your menstruum in herbalism). 1. What kind of alcohol you used, and the percent of alcohol by volume. 2. Whether you used fresh or dried herb. 3. The common name and the Latin name of the plant used (in this case nettle in Latin is Urtica dioica). 4. The date you made the tincture. Let the mixture macerate, shake the jar every day and store it in a cool dark cabinet. Make sure the herbs stay covered with alcohol, and add more if needed. This is a great time to put good energy into your herbal creation and visualize all the ways it’s going to help you once it’s finally ready. After 4-6 weeks have passed, you can then press out your tincture. Don’t worry too much about the time, some folks wait as little as three weeks and some wait much longer. To start the pressing process, unscrew your Mason jar, put your muslin or cheese cloth over the top and then flip over the jar above a large bowl to drain out the liquid while separating the herb. Once all the liquid has gone into the bowl, you can then use both your hands to squeeze out any remaining liquid from the herb. Next, pour that liquid (which is now your tincture) into a liquid measuring cup. Place your funnel in the mouth of your dosage bottle and carefully pour your liquid into it. The number of bottles you’ll need to store these tinctures in will depend on the amount initially created. You can also put the tincture back into the Mason jar until proper storage is found. You can now use this format with many of the medicinal herbs in your own home garden. Of course, it is important that you get to know the identity of the plants you’re working with first, and research the dosage and safety information from trusted sources. Each tea, tincture or herbal preparation created is an opportunity for you to take your health into your own hands. We hope this ritual empowers you as a growing herbalist and inspires you to establish an even deeper connection with the plants around you. For more DIY inspiration, check out our Homemade Citrus Spiced Dandelion Bitters. Consult your healthcare practitioner prior to use if you are diabetic or if you are pregnant or breastfeeding. In sensitive individuals, nettle leaf preparations may occasionally cause mild gastrointestinal upset or allergic reactions. Do not use this product if you have a known hypersensitivity to nettle plants. Not recommended for use with children under 12 years of age. Whether you’re interested in growing medicinal herbs, creating herbal medicine or becoming an herbal practitioner, there’s a book for you!